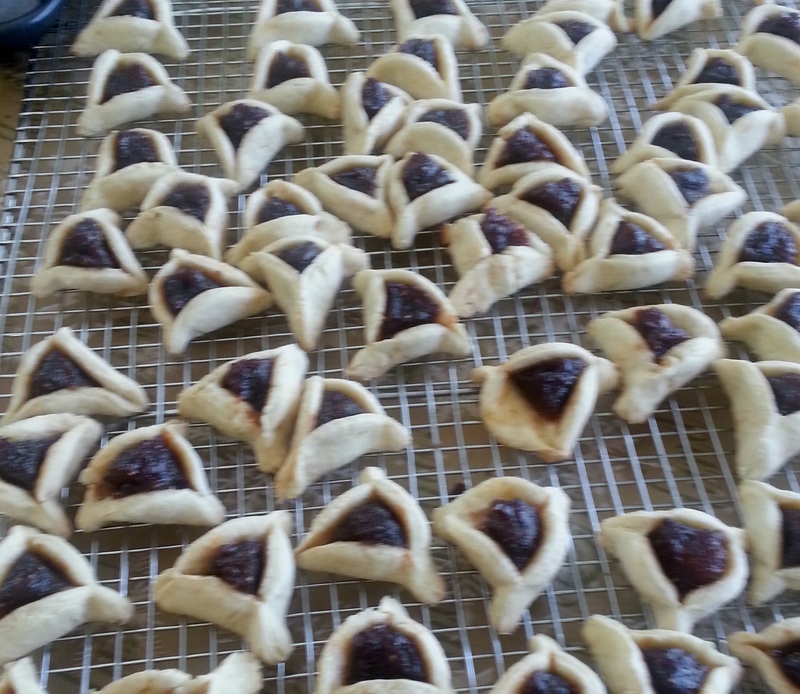 Passover is a time of stories and symbols. As the holiday draws to an end, I wanted to share one of the most fun things we served at our Seder this year. Last year my hubby, Mark, led us in the The Two Minute Haggadah for the second night of Passover. 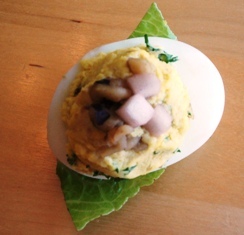 Everyone thought it was a riot and we joked that there should be a dish to match that contained the essence of the Seder in a few bites. A few days before Passover began, we remembered the conversation and tossed around various ideas of how to make a bite-size Seder. 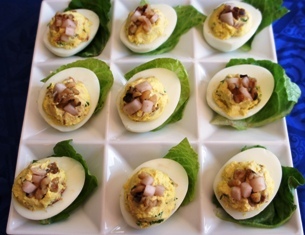 We hit on deviled eggs as the perfect medium for our holiday madness and Mark insisted that we call them “Wicked Son Eggs”. Off to the kitchen I went to figure out a recipe. It is practically blasphemy to say it this time of year; but I don’t like eggnog. A nice frothy homemade batch will do as a conduit for bringing rum to lips, but it is just not my favorite holiday beverage. A warm mulled wine, cocoa spiked with spirits, or an elegant tall glass of bubbles are more my style for celebrating. When my stepdaughter insisted on buying some eggnog at the supermarket, I groaned. She is the only one in the house who would drink it and as I predicted after sipping a tiny glass, she grew bored with it and moved on to something else. I hated to waste the rest of the container of eggnog so I decided to see if I could bake it into something I would like. Much of what I don’t like about commercial eggnog is the syrupy sweet flavor and the heavy texture. I like rich creamy feel in custards but not in drinks so I decided to whip up a custard and offset the sweetness with some farmers cheese. I am sure ricotta would have worked as well but farmers cheese was what I had on hand and the slighty salty flavor was perfect. and poured it in the chilled shell. I baked the tart for about 40 minutes at 350 degrees and then let it cool. 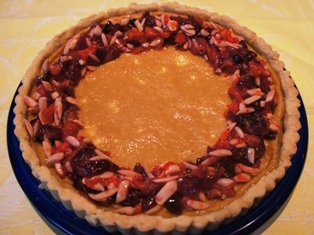 Since I had leftover candied citrus and cranberries which I had made for another recipe, I sprinkled them on the tart along with some blanched almonds for extra crunch. NOTE: An unbaked pie shell would also work for this recipe as well. With my first bite, I knew that I would never feel the same about eggnog again. After my friends devoured slices of my eggnog “pie”, I realized that I might even have to keep some of the previously maligned beverage on hand just for this recipe. Happy and Delicious New Year to everyone! I bought some peaches as soon as they showed up at the farmers market and they were delicious if a tiny bit under ripe. 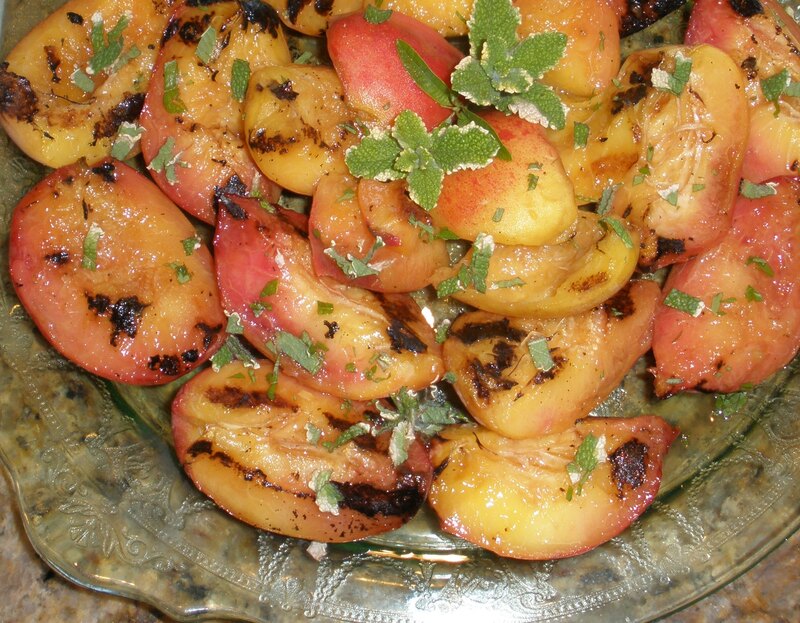 The next week I bought more and we ate some for a snack and made a delicious salmon with white wine and sliced peaches and grilled peaches with mint and honey. Next I bought a small bag of perfectly ripe nectarines which was demolished amid contented sighs and sticky hands coated in juice. The peaches and nectarines and plums were so good this year that they made me feel sad to think that the season would soon draw to a close. I could not imagine being without this friend through the long winter so out came the canning supplies and soon I had created a small winter stash of white and yellow peach preserves with cinnamon and port wine, spicy peach with Hungarian peppers, a small batch of peach and lavender, and a tart plum and ginger sauce. We often think of jams and preserves as spreads for toast; but they are wonderful for savory and sweet dishes. 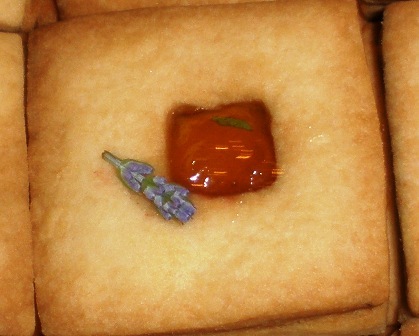 Try serving homemade jam on a cheese platter, or use as a meat or fish glaze, and use preserves for filling tarts and cookies as I did with the simple shortbread cookies shown here stuffed with peach and lavender jam. 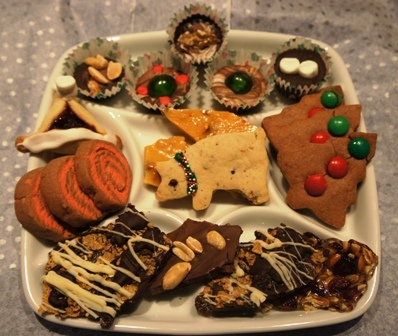 I am always looking for low-fat and fat-free treats to balance out my richer offerings. This recipe eliminates all the oil and uses apple cider to give the bread a slight sweetness and a tender texture. 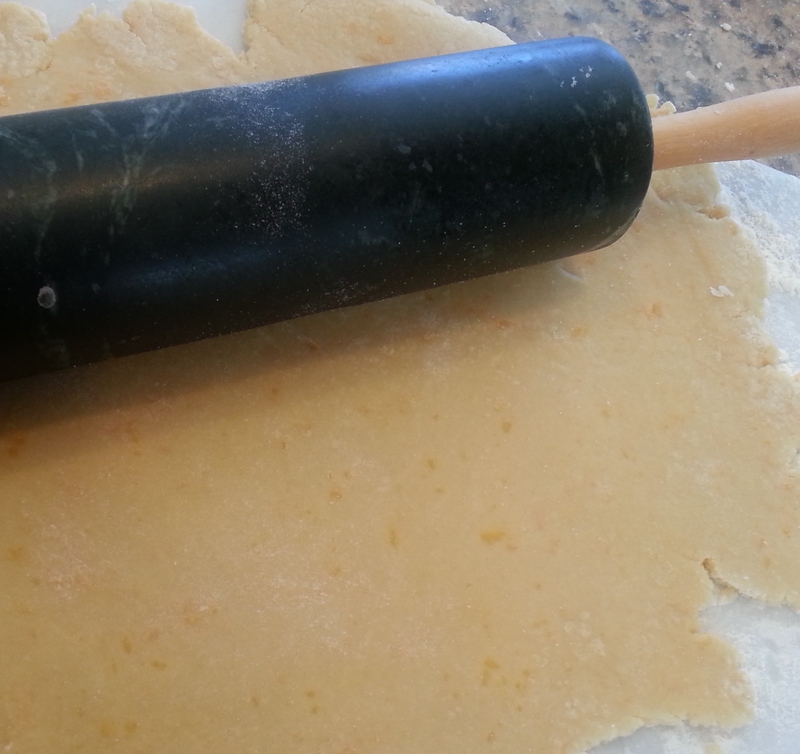 I used fast rise yeast but you can also use regular yeast and give it extra time to rise. With the fast rise, it makes a great last-minute addition to dinner or brunch. 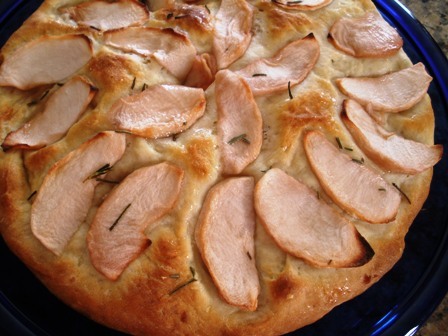 The main recipe is below and you can top the bread simply with kosher salt and rosemary or other herbs, brandy soaked apples as in the picture, or carmelized onions. Bake for about 25 minutes until brown on top. The bread should have a slightly hollow sound when tapped.